From experiencing the coldest temperature ever recorded with lows colder than the Antarctic and even Mars, temperatures are expected to swing 40 to 80 degrees Fahrenheit, (up to 27 deg C) upward from the lowest levels amid the polar vortex invasion as the midwestern and northeastern United States are treated to a taste of March to start February. According to AccuWeather, The warmth is also expected to surge across all of the Midwest, mid-Atlantic and into New England Sunday into early next week. On the warmest day, highs to around 60 (16 deg C) are anticipated northward to the Interstate 70 corridor from St. Louis to Washington, D.C. Even Philadelphia can flirt with the 60-degree mark. Highs in the 50s may have residents in Chicago, Detroit, New York City and Boston replacing winter jackets with lighter spring attire. 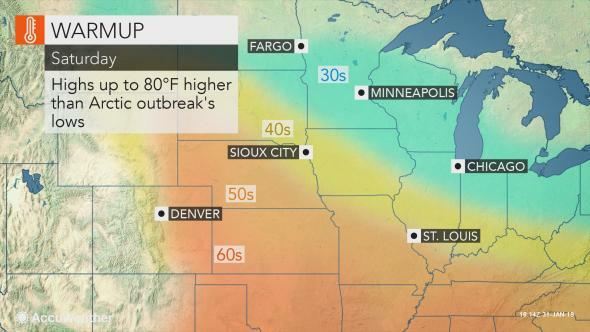 For Chicago, Minneapolis and other parts of the Midwest that endured the harshest cold of the Arctic outbreak, the upswing in temperatures can be as high as 70 to 80 degrees. A break from the cold is definitely great news for residents dealing with higher heating costs, frozen pipes and animals and kids cooped up due to concerns over frostbite and hypothermia. "The sudden warmup could lead to ice jam flooding on some rivers as large chunks of ice break loose and jam the flow of water downstream," according to AccuWeather Meteorologist Bill Deger. Records have been shattered as the polar vortex unleashed the harshest cold in years on the midwestern United States during the final days of January.